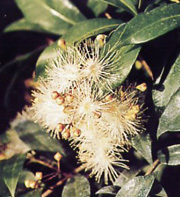 Also called Syzgium Paniculatum, Australian Brush Cherry. 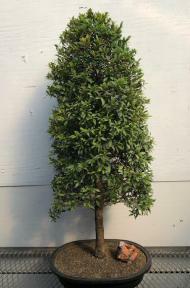 Has small handsome evergreen leaves which are firm and glossy. White puffy blooms are attractive in spring and summer. If it receives enough light, the leaves will develop red highlights. Great for indoors. Indoor flowering bonsai tree, grown and trained by Bonsai Boy in the Christmas Tree style. Potted in a 17" brown oval mica container. Suitable humidity/drip tray is recommended. To purchase add $18.95. Red bow included. Perfect for smaller living spaces! Decorate for the holidays, then enjoy all year round.